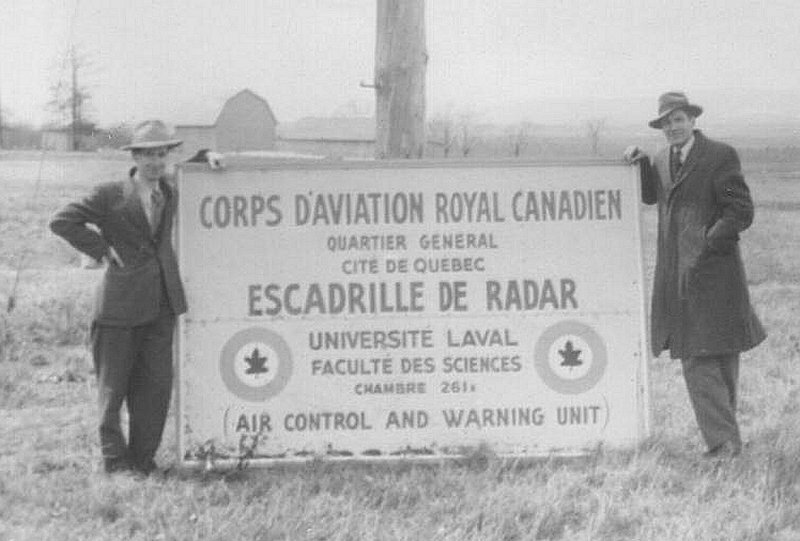 2452 Aircraft Control & Warning Unit (Reserve) RCAF was formed at Quebec City on 15 April 1951 and was physically located on the campus of Laval University. This new unit was formed around the No. 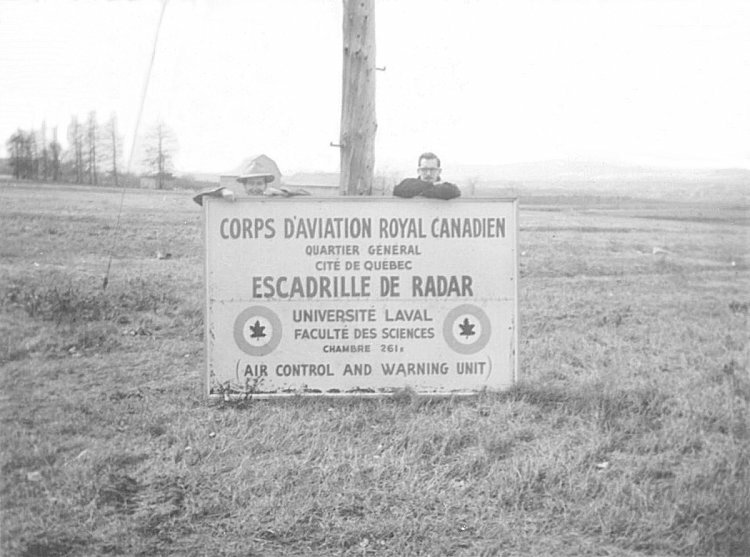 1 Radar and Communications Unit Detachment Quebec City. The Unit moved off-campus in 1952 and took up residence at 114 St. Johns Street. 2452 AC&WU was re-designated as 2452 Aircraft Control and Warning Unit (Auxiliary) RCAF on 1 November 1951 and then on 1 December 1953 they went from unit to squadron status. The squadron was initially located at 148 St-Jean and subsequently moved to the Bell Telephone building at 114 St-Jean. 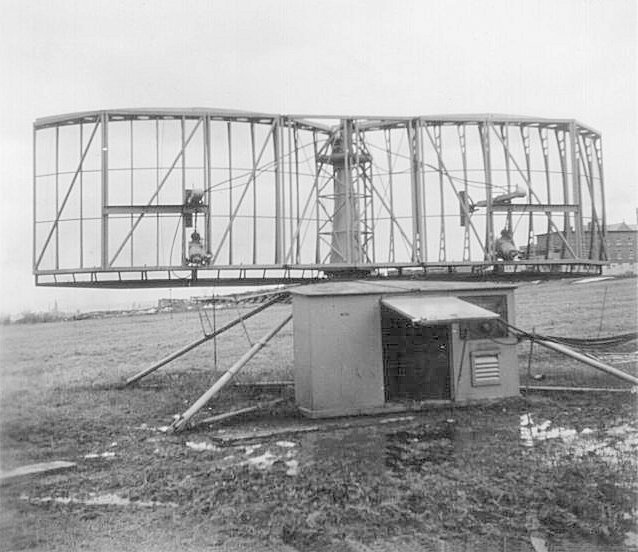 2452 AC&W Squadron personnel were regularly employed during summer camps and on weekends throughout the year at a number of Regular AC&W Squadrons. These included Ste. Sylvestre, Mont Apica, Lac St. Denis and Senneterre. Narrative reports on the Pinetree Line web site confirm that 2452 AC&W Squadron was active at RCAF Station St. Sylvestre during the years 1955 and 1961, RCAF Station Mont Apica between 1952 and 1959 inclusive as well as RCAF Station Lac St. Denis in 1955. On 1 October 1958, 2452 AC&W Squadron began to report directly to Air Defence Command. With the advent of the SAGE system in the Regular AC&W Squadrons, it was decided to disband all of the Auxiliary Squadrons. 2452 AC&W Squadron was disbanded as of 31 December 1961. Organization Order R2.0.1.0 - 12 June 1961. Historical Narrative - 1 June 1961 to 31 December 1961. Organization Order R2.0.0.11 - 16 June 1958. Organization Order R2.0.11.6 - 19 February 1957. General History of 2452 AC&W Squadron (English text) - 16 November 1956. 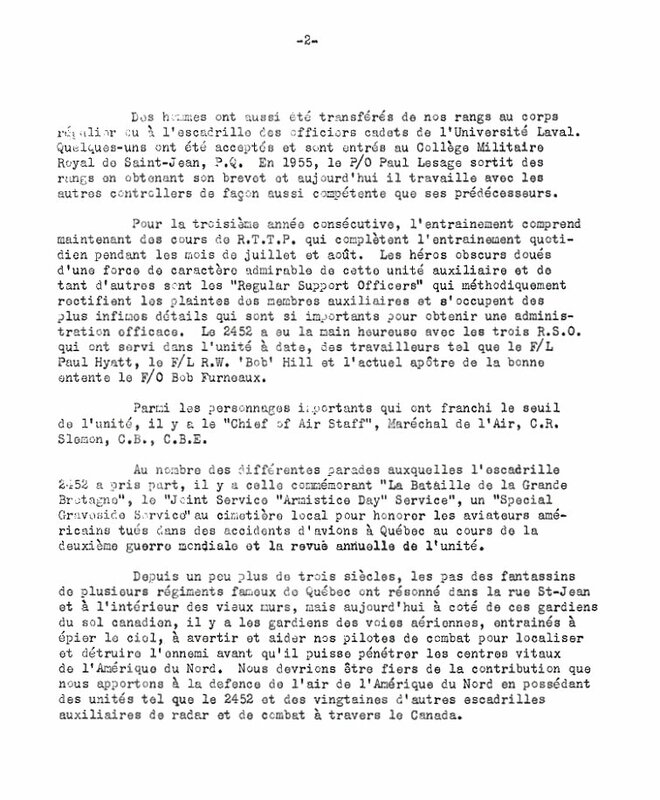 General History of 2452 AC&W Squadron (French text) page 1 of 2 - 16 November 1956. Courtesy of National Archive of Canada. 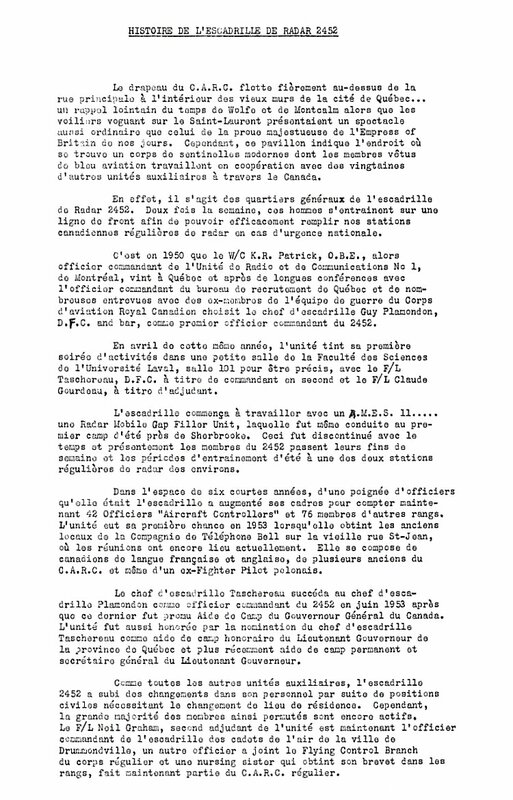 General History of 2452 AC&W Squadron (French text) page 2 of 2 - 16 November 1956. Organization Order R2.1.11.6 - 28 December 1954. Historical Narrative - 1 December 1953 to 30 November 1954. Organization Order 90/53 - 24 November 1953. 2452 AC&W Squadron personnel in Quebec City, Quebec - January 1952. 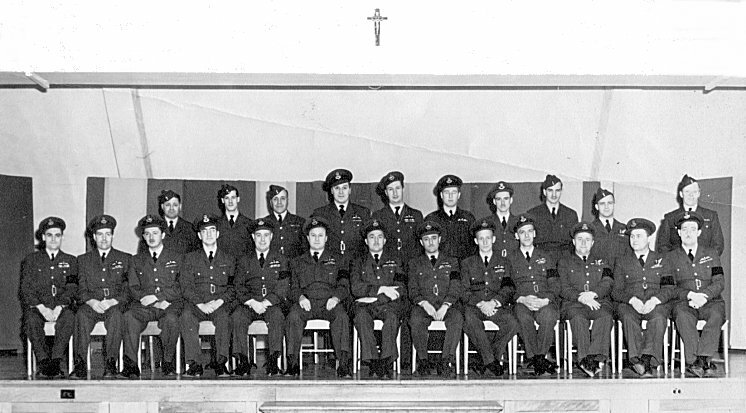 Back row 1st left Sgt ?, regular Admin; 2nd left Laurier Gendron, Instructor; 3rd right Bill ?, Radar Tech; 2nd right Cpl ?, MSE Section. All other are Reserve personnel. Historical Narrative - 1 December 1951 to 30 June 1952. Organization Order 23/51 - 3 April 1951. 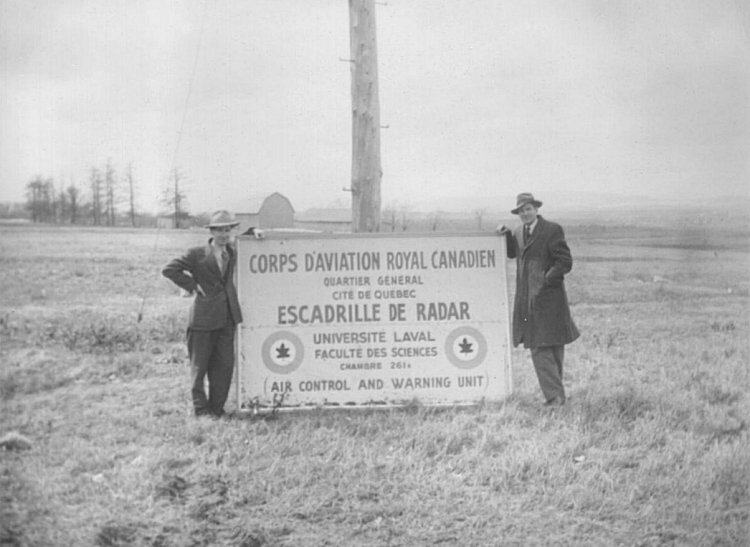 John Livick of CAE and Ivan Mark propping up a local sign - April 1951. Larger image of the sign - April 1951. 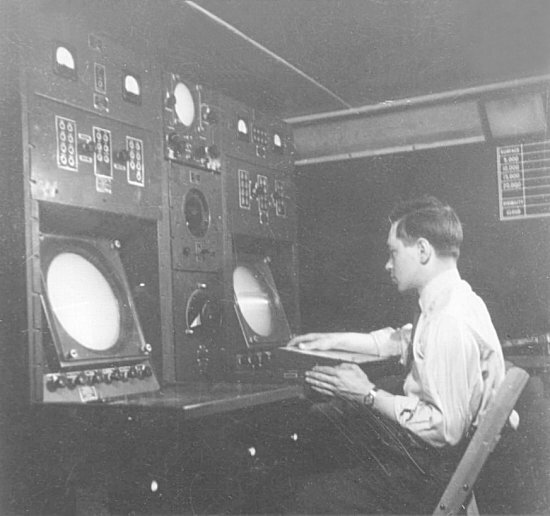 John Janega (CAE) at the AMES-11 range display (type A indicator) - April 1951. To his left is the PPI display (type P indicator). 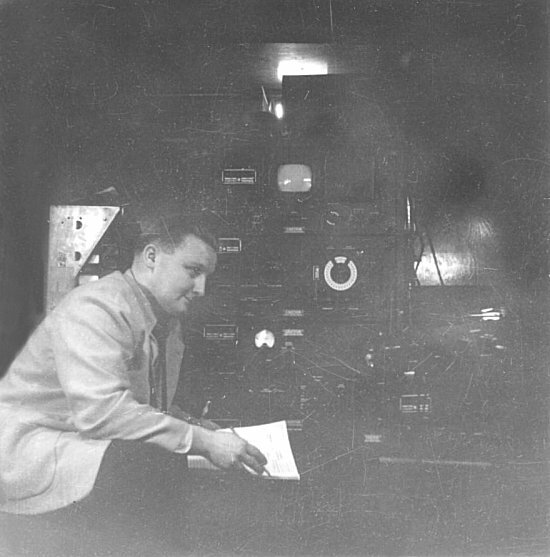 Ivan Mark in front of the IFF rack-cabinet - April 1951. On the top of the IFF equipment is a type I-222 signal generator. 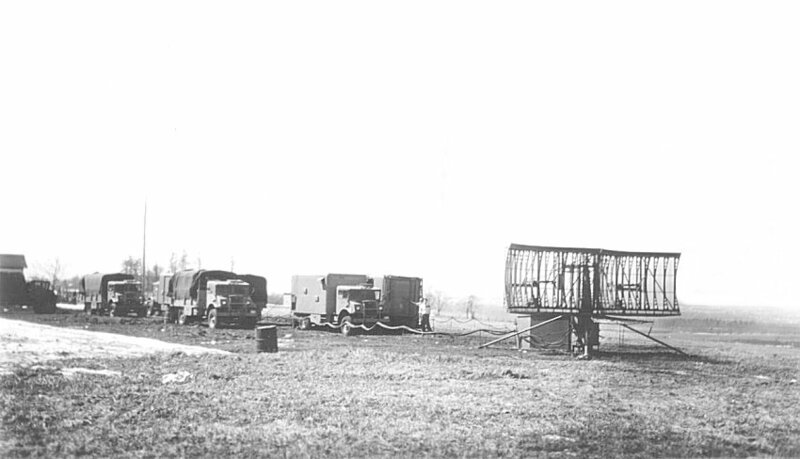 The convoy in a muddy field - April 1951. 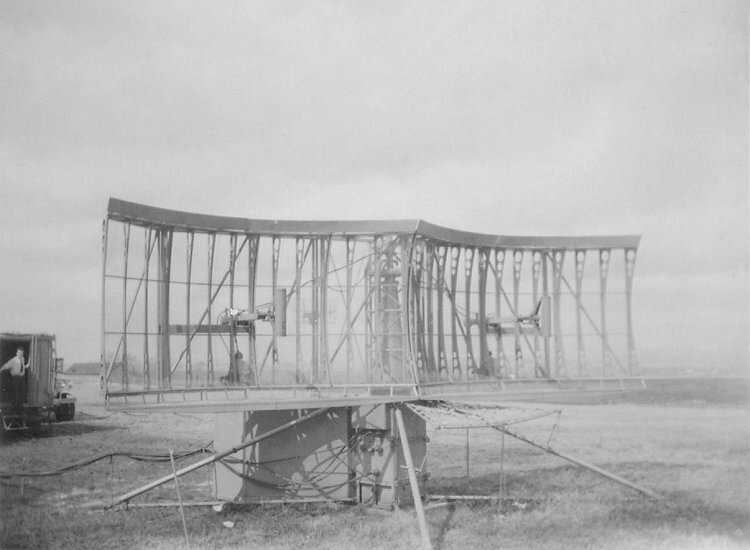 Close up, frontal view, of the AMES-11 "Twin Truncated Parabolic Antenna" - April 1951. Jerry Lyman (CAE) and Ivan Mark trying to learn French - April 1951. Ken Asten, DNDIS, going through the IFF check list - April 1951. 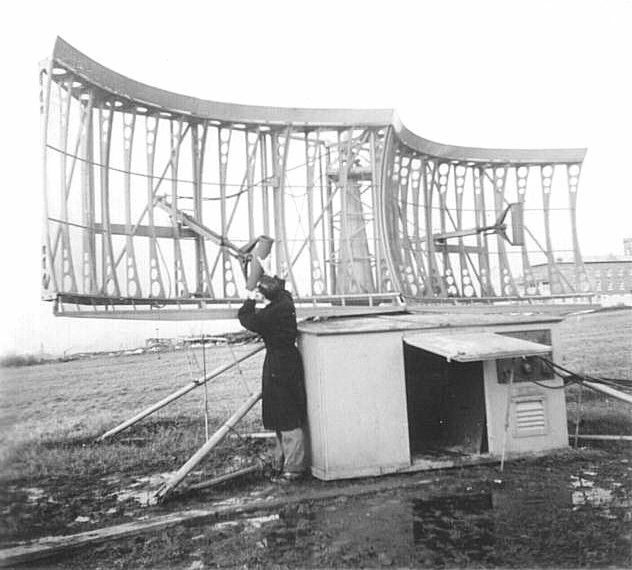 Ken Asten, DNDIS, after inspecting the IFF antenna - April 1951. 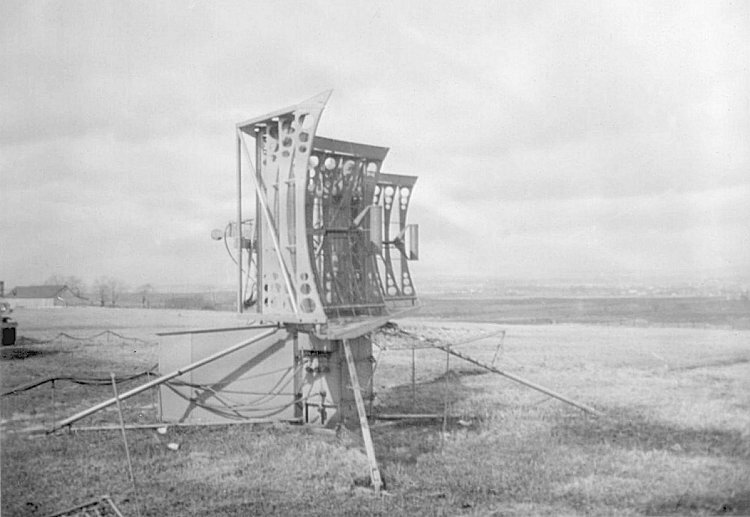 The AMES-11 radar antenna and the "doghouse" - April 1951. 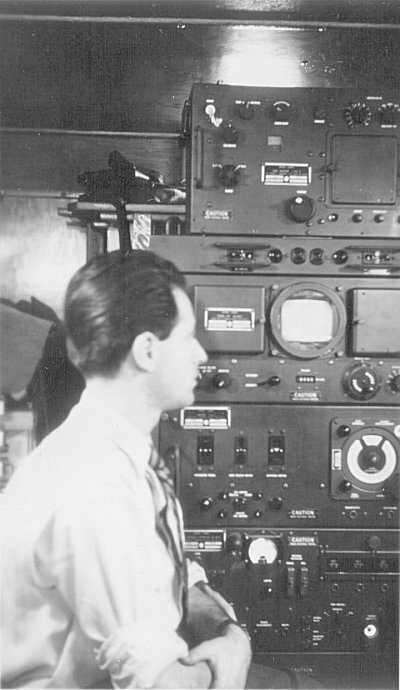 The "doghouse" contained the modulator, transmitter, receiver, oscilloscope and their power supplies. 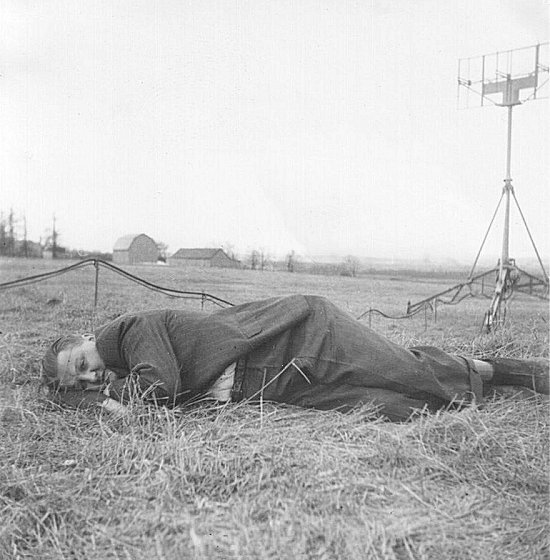 Jerry Lyman (CAE) adjusting one of the dipoles on the radar antenna - April 1951. 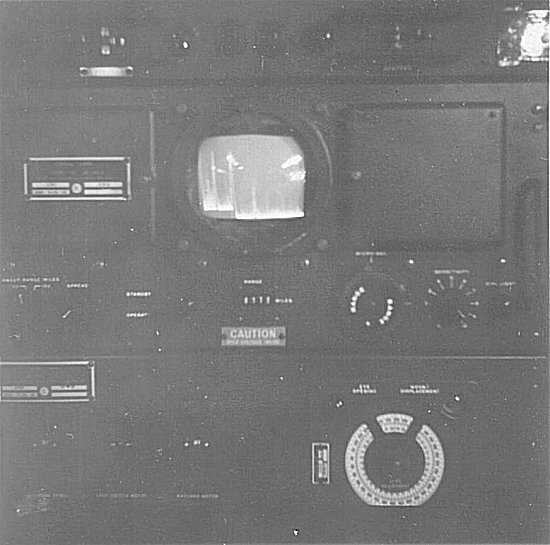 Close-up view of the IFF display (type N indicator with range step) - April 1951. When the pip is aligned with the step, the range can be read from a counter or dial. In this case, it showed 31.4 nautical miles. 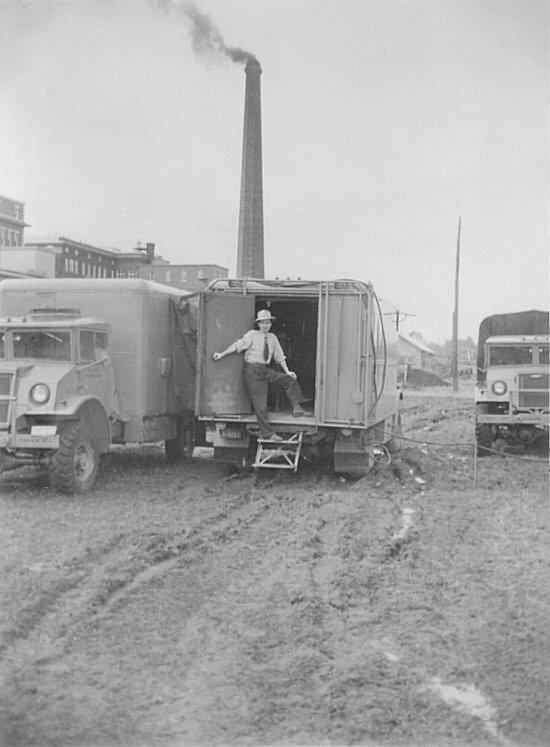 Another view of the radar antenna and some local mud - April 1951. 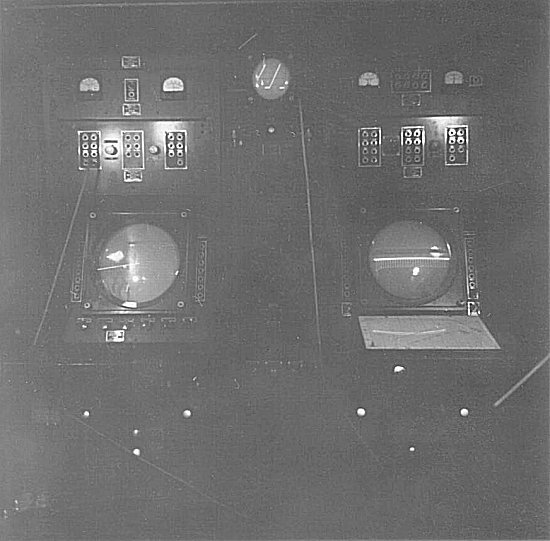 The AMES-11 radar display console - April 1951. Ivan Mark in the IFF van - April 1951. The chimney did not belong to the convoy.